Glass Beach: "The Envelope, Please"
I'd gotten a few requests for a wallet larger than my 3 Pocket Flip Wallets but smaller than my Passport Wallets. "Easy Peasy!" I thought. Well, countless prototypes later, I finally came up with a design I like. It's really just a mash-up of my other wallets but I had the hardest time wrapping my head around the design. I also had fits about which interfacing to use. My final design ended up using 3 different weights. The one pictured above uses a sheet I got at the thrift store. Yay, upcycling! 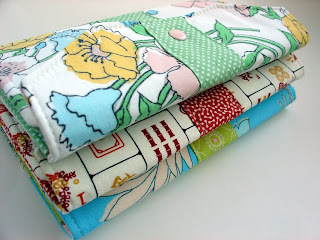 I think I'm going to try using more upcycled fabrics. These three are now listed in my shop and I hope to make some more in the near future. 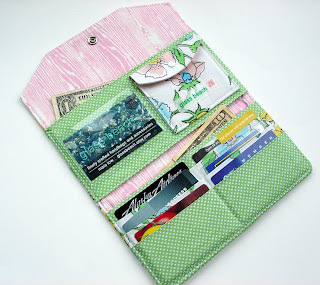 I've also gotten some questions about the pattern for this wallet. 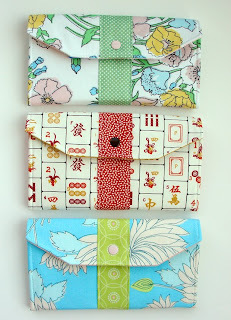 I've been thinking of self publishing some of my patterns...do any of you know how to go about this? That's a really nice design! I hear tell PDF's are the way to go, but I don't know how you go about building them. I know that a relative of mine had to go attend a class (for her job) on using Adobe Acrobat - many hours of instruction, and still only scratched the surface. I would love to get this pattern from you! It is a beautiful design! Those are really nice wallets!